Check out Tobi's Night Rider Moto Jacket Get yourself a cord jacket to keep warm and chic this winter. Lost + Wander's Night Rider Black Moto Jacket nails that classic biker jacket look you love, featuring gorgeous corduroy, zipper front, long relaxed sleeves, collar, zipper details on the sleeves, and a smocked waist. Keep your winter 'fits edgy with this corduroy biker jacket, and pair it with ripped denim jeans and booties. Get yourself a cord jacket to keep warm and chic this winter. 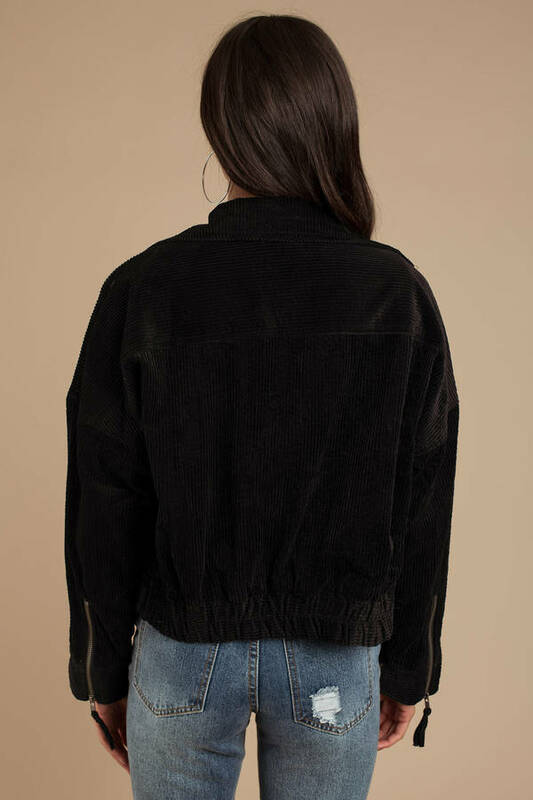 Lost + Wander's Night Rider Black Moto Jacket nails that classic biker jacket look you love, featuring gorgeous corduroy, zipper front, long relaxed sleeves, collar, zipper details on the sleeves, and a smocked waist. Keep your winter 'fits edgy with this corduroy biker jacket, and pair it with ripped denim jeans and booties.